One of the things I was warned about before coming to study in Australia was that certain times of the semester are extremely busy, while others are relatively light. I’m here to report back that this is definitely true! My past few weeks have been chock-full of exams and assignments, but for the next few weeks I haven’t got much going on. Now after recovering from my past few weeks (and the delightful disease my mates and I have dubbed the ‘Canberra plague’), I can recount what I’ve been up to! 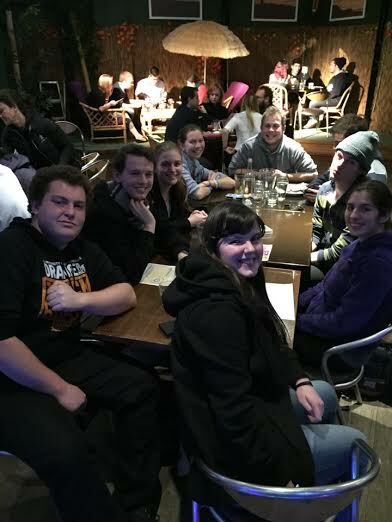 Like I mentioned in my last blog post, last weekend I travelled to Canberra, the capital of Australia, with the Sydney University Quidditch Society. While in Canberra, we played a tournament against other teams in New South Wales. Technically, Canberra isn’t in New South Wales but in the Australian Capital Territory, like how Washington isn’t in Virginia or Maryland but the District of Columbia, but it’s grouped with NSW for geographic reasons. 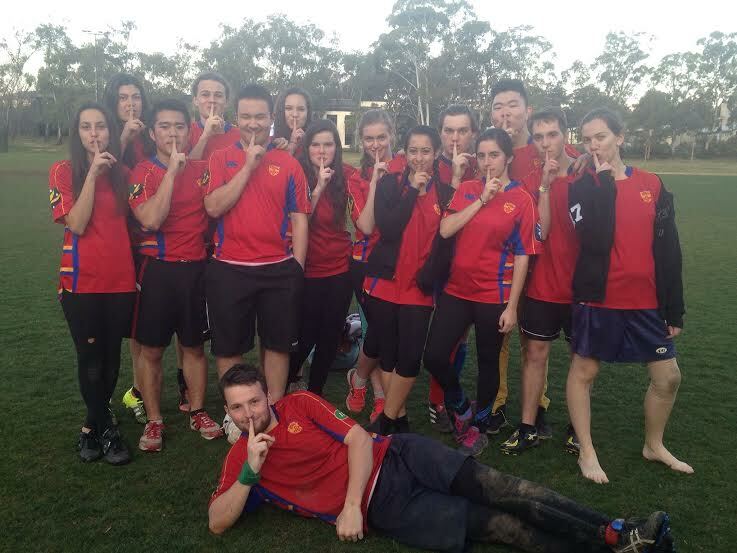 The USYD Quidditch Society at the September Triwizard Tournament at Australian National University! Our team name is the Unspeakables, and so we take this picture after every tournament. We may have gone 1 in 3, but we looked pretty fierce doing so. Speaking of Washington, D.C., comparisons between it and Canberra were on my mind for most of the trip. Unlike DC, Canberra is almost an embarrassment to Australians — it’s a small city in the bush lacking in grandeur. My Australian friends who don’t play quidditch were a bit perplexed as to why I was bothering going to Canberra. However, Canberra’s similarities to DC were pretty interesting to this American. It’s got the cherry trees, a big body of water in the middle, a “Capital Hill” with the Parliament House at the top, and very confusing roundabouts. Like DC, it was a planned city, a compromise between Sydney and Melbourne. However, while DC feels very lively, Canberra feels more like someone built a city and then forgot to put people in it. Driving from Sydney to Canberra is a bit eerie — you’re in the middle of nowhere and all of a sudden, a small city appears, seemingly out of thin air. It’s so remote that half an hour before we got to Canberra, my mates and I got out of the car and did a bit of stargazing because the light pollution was so noticeably absent. Anyone who’s driven the cesspool that is I-95 into DC knows this is the exact opposite of that experience. Due to the prevalent belief among Australians that there’s not much to do in Canberra, we spent a lot of our time in the cabin we rented for the weekend, hanging out and playing mafia, the signature card game of the Quidditch Society. So naturally, I don’t have many pictures documenting my weekend in Canberra. The one downside I’ve found of having mostly local friends is that they aren’t particularly interested in doing touristy things like visiting monuments or museums, so I didn’t visit anywhere that really warranted picture-taking. Perfectly understandable, if a little disappointing! Luckily, one of my quidditch friends is a newcomer to Australia and just as keen as I to be unashamedly touristy, so we’ve been doing fun things in Sydney like going to the aquarium together. While I’ve loved my experience so far being fully immersed into Australian life, it is good every now and then to take a step back. I have to keep it all in perspective and remember that I’m not here permanently, and I need to take advantage of my time here. 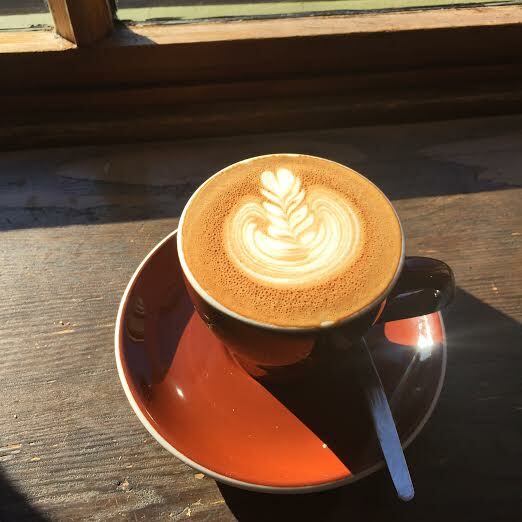 Right now, I’m finding that the best mixture is having a set routine during the week of school and going to the pub with my quidditch mates, and dedicating one day of the weekend to freedom and touristy exploration. Balance is key! I also learned from this trip how to better go with the flow. I’m naturally pretty controlling — I like to be in charge and make decisions. It’s not the best part of my personality. But during this trip, I wasn’t the one driving and therefore had no control over where we went or what we did. It was frustrating, but also a necessary experience for me. 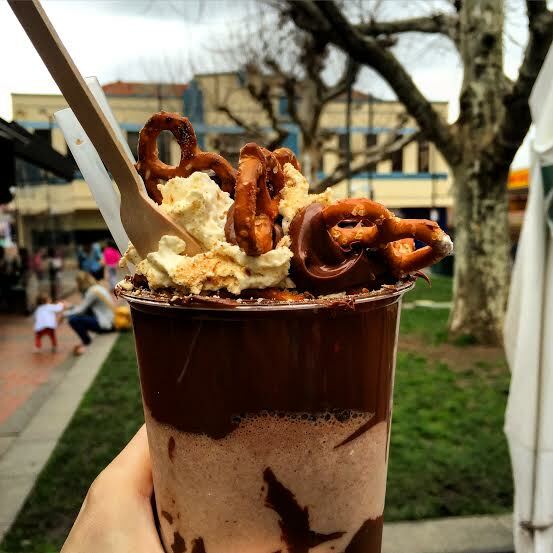 Being more flexible was something that I needed to work on, and I think this trip was a really good exercise for me in learning to let go of the need to obsessively plan out a trip. Especially when traveling, things don’t always go according to plan, and it’s good to be prepared to handle it. As I’m now getting into week 4 of classes (it’s absolutely incredible how fast time is flying! ), I thought now would be a great time to talk about uni life here in Sydney and how it compares to Richmond. A quick aside: the word “uni”! Australians are all about abbreviations, as seen in this video we watched at orientation at USYD. And yes, it’s USYD — I haven’t heard students use the full name of “University of Sydney,” just USYD. Thanks to a particularly stressful junior year and the maximum number of AP credits, I’ve just about finished my major, minor, and general education requirements at Richmond. This meant I got to select any classes I thought seemed interesting (and had good class times!) to take in Australia. Like Richmond, the normal course load is four classes. My four are introductory macroeconomics, introduction to computer programming, synthetic medicinal chemistry, and a course on Australian political history and ideas of nationhood. Every class here has two components: a lecture and either a tutorial or a practical. Lectures are held in enormous lecture halls and consist of the instructor presenting on material for either an hour twice a week or two hours once a week. At first, the size of lectures was completely overwhelming — the largest class I’ve ever had at Richmond was about 35 students. I walked into my upper level chemistry class on the first day in awe at the hall with about 100 students, and commented on it to the girl next to me. She gave me a weird look and said, “Really? This is about a quarter of the normal lecture size.” Over the past few weeks, I’ve gotten more used to these large classes. It’s a lot more intimidating to ask a question in a lecture here than it is in the intimate classrooms at Richmond, but questions are not discouraged by any means. Lectures here are also recorded, so if I ever felt like I missed something in lecture, I can always go on Blackboard and re-watch the lecture. The other parts of classes are probably more familiar to Richmond students. Tutorials (“tutes”) are once a week and essentially discussion groups with a graduate student and about 20 fellow students. The small size, mandatory attendance, and personalized attention remind me a lot of Richmond classes. Practicals (“pracs”) are the equivalent to tutes for more scientific classes like my computer science or chemistry units, and are just like labs at Richmond. The last major difference between coursework here and in America is the number of assignments. For example, there’s only one assessment in my chemistry course — the final exam, which is worth two-thirds of the grade (“mark”). The other third of the mark comes from three labs in the practical. This means there’s little incentive to learn the material throughout the semester, compared to Richmond, where I typically have three tests during the semester in addition to the final and other assignments like homework. The responsibility for planning and learning is put directly in the hands of the students. Getting away from academics, probably the biggest difference between uni life in Sydney and college in the States is the social life. Most students at USYD commute from home, sometimes up to three hours roundtrip, instead of living on-campus like at Richmond. This means after classes are over for the day, the campus can seem deserted. An Australian I met in my chem prac told me that his favorite parts of his exchange spent at the University of North Carolina were the school spirit and college sports, two things that are distinctly lacking in Australian universities due to the commuter atmosphere. The “Sydney University” sweatshirts embody that — they’re mostly worn by international students, not Australians. Yes, I did get one, and I wear it proudly. No shame. One thing that does remind me of Richmond — this spider! I saw it painted in the middle of a busy sidewalk on campus and had to take possibly the world’s most awkward selfie with it. Again, no shame. To integrate myself more into the campus life that does exist, I’ve joined a few societies, which are the equivalent to our clubs. I played quidditch my first two years at Richmond, so I decided to join the Quidditch Society here at USYD. This is turning out to be one of the best decisions I’ve made since coming to Sydney. Being part of a team gives you an instant group of friends (or mates as they’re called here!) and also opportunities to travel — for example, in a few weeks I’m going to the Australian capital, Canberra, for a tournament. Every week I look forward to the practices and the classic Aussie tradition of going to the pub afterwards with my mates, for a few drinks, dinner, trivia, and card games. While university in Australia is definitely different to college in the US, it doesn’t mean that it’s bad. I’ve really enjoyed stepping out of my comfort zone and adapting to a different sort of university experience. The independence here can be overwhelming – from the anonymity of lectures, the lack of incentive to study throughout the semester, to the ability to avoid interacting on campus. So far, I’ve tried avoid the common pitfalls and keep up with my studies. We’ll see how successful I am as the first assessments come due! Next week I have a five page paper for my history class due… as a chemistry major who hasn’t taken a true writing-intensive course besides French since FYS, I’m a little nervous. But challenging myself is exactly what I came to Australia for, so I think I’m up for the task. The main building on campus, called the Quadrangle. This marks another difference to Richmond — while some buildings on campus are just as gorgeous as the Quadrangle and any building at Richmond, the architecture is ridiculously heterogeneous. I won’t disgrace your computer screens with a picture of the hideous monstrosity that is the chemistry building. Hello from Sydney! Sorry about how long it’s been since I’ve updated. I’ve been so busy falling in love with Australia that I forgot to update this blog! I’ll try and detail some of my first impressions about Sydney here (although at this point, I’ve been here for about three and a half weeks). Many people who are thinking about traveling to Australia fixate on the length of the flight. While it is undoubtedly long, it’s not unbearable. I was lucky enough to have a nonstop flight (the world’s longest!) to Sydney from where I live in the States, Dallas, which definitely helped cut down on the travel time. Between the movie, two meals, six episodes of Grey’s Anatomy, and sleeping, the 17 hours passed by more quickly than I had expected. I’ve often thought over the past fourteen years what it would be feel like to finally arrive back in Australia and see it from the plane. Before selecting my seat, I carefully researched the best position to catch a glimpse of Sydney from the air… but neglected to consider the fact that I would be landing around six o’clock in the morning. In the middle of winter. Needless to say, it was pitch black when we arrived in Sydney, and my 17 hours spent in the window seat was for nothing. Even then, the lights of Sydney that I could see and the sensation of being on solid ground again combined for a wave of emotion, a mix of nostalgia and excitement. Once off the plane, I was immediately struck by the weather — apparently it was the coldest stretch in Sydney in years! Though jarringly different from the 100-degree days I had left behind in Texas, I quickly discovered it actually… wasn’t that cold. More than my massive suitcases, the thing that pegged me immediately as a foreigner was waiting on the outdoor platform for the train to my apartment in a short-sleeved T-shirt. Since then, every reference to the brutally cold winter by an Australian has just made me smile — by Richmond standards, this is nice spring weather! The very welcoming signs in Sydney Airport made me very happy. I arrived in Sydney on a Friday and left early the next morning for my first trip, a weekend pre-orientation for exchange students up to the Hunter Valley and Port Stephens, which are a few hours north of the city. This trip was a whirlwind — in less than two days, we went to the Australian Reptile Park and got up close and personal with some furry locals, wine tasting, whale watching on a boat, and sandboarding down massive sand dunes. Me with a kangaroo friend, 2015. Me with a kangaroo friend in 1999. Guess I’ve changed a lot since then, but kangaroos are just as cute. I spent the rest of the week before classes began discovering Sydney — just taking off in a random direction from my flat in Redfern, a suburb a bit more than two miles from Circular Quay, which is the part of Sydney’s downtown (what the locals call the CBD or central business district) that most people associate with the city, and exploring whatever area I find myself in. What I’ve noticed so far is that “Sydney” is a bit hard to define. The CBD is a very small area, and even the “city of Sydney” which is the umbrella for the CBD and the inner suburbs is still much smaller than I imagined, with a population roughly similar to the city of Richmond. Only when adding in the massive metropolitan area, which stretches about an hour in every direction, can you appreciate the full population of the city. Nevertheless, I remember exploring Sydney’s Haymarket, Sydney’s Chinatown, during my first week in the city and feeling the energy from the crowd as I walked down Sydney’s major street, George Street. Normally I feel a little overwhelmed and claustrophobic in a big crowd, but for some reason, it just felt lively and freeing. I realized then how much I already loved being in Sydney. The classic touristy picture from Circular Quay of the Sydney Opera House and the Sydney Harbour Bridge. Surprisingly haven’t been here in the daytime yet. I especially love Sydney’s compactness and ease of public transport. Coming from America, it’s amusing to listen to Sydneysiders complain about their public transport — at least it exists! It’s a fairly quick walk from where I live to most of the inner suburbs or the CBD, and I can easily find a train or bus to wherever I want to go. Where I grew up in New Jersey, the closest train station that would take me on an hour-long train ride to Manhattan was a half an hour drive away! This ease of travel has made it simple for me to explore Sydney, especially the quirky neighborhoods of Surry Hills, Glebe, and Newtown. Every day, I fall more in love with the city, and every so often I’ll turn around and see a view like the ones below that just reminds me how lucky I am to have the opportunity to be here. I can’t wait to discover more of this amazing city, and finally venture to the famous beaches when it gets a little warmer! The Sydney skyline from Victoria Park, the park that borders my university. I’m a rising senior. The majority of Richmond students who study abroad do so their junior fall, but I’ve met people who’ve studied abroad semesters ranging from sophomore fall to junior spring. But senior year? I didn’t know it was possible. It’s much more common than I thought – there are at least five other rising seniors going abroad that I know of. Hopefully this blog will help dispel the myth that there’s only one possible semester to study abroad! I’m a chemistry major. Anecdotally, it seems like science majors are underrepresented in study abroad. For example, of the 21 chemistry majors in my grade, I will be just the fifth to go abroad for a semester. While it is definitely possible to fit in a semester studying abroad into a timeline of required science courses, it requires careful planning. I’ve heard a lot of my fellow Gottwald enthusiasts talk about how they didn’t study abroad because it wasn’t possible with their major. I’m hoping to help bust this myth as well and show how studying abroad can complement any major. I’m a citizen of my host country — I moved to America from Australia when I was seven years old. This was the reason that I originally thought I didn’t want to spend a semester abroad when I first came to Richmond. I thought that my international experiences before college meant that I couldn’t gain anything from spending a semester abroad. I’ve now come to realize that I couldn’t have been more wrong. The summer after my freshman year, I spent a month in La Rochelle, France, taking classes for my French minor. While I had a wonderful summer eating baguettes and practicing French with my host family, the small taste of a study abroad experience left me longing for more. My program was rigidly structured, with weekends designated for group trips, and independent travel outside of La Rochelle was prohibited. I itched for the opportunity to travel on my own and discover the country for myself. The more I thought about my experiences in France after my return, the more my desire to take a risk and spend an entire semester abroad grew. I knew as soon as I started considering studying abroad that I wanted to rediscover my birthplace, which has always held a special place in my heart, despite my faint memories of it. The University of Sydney was a logical choice — I love beaches and big cities, the university has an enormous class catalog, which is perfect for a science major with diverse interests, and it’s only an hour and a half away from Wollongong, the city where I grew up. Australia’s academic calendar is very different than America’s, and the spring semester (known as semester 2) runs from the end of July to the beginning of November. So even though it feels like I’m still in the middle of summer break, it’s time for me to leave for Sydney! It’s hard to describe the emotions I’m feeling. I’m leaving a lot behind in America– my entire extended family is here for a family reunion. They live all over the world, from Iran to Sweden, and so I only see them about once every five years. I’m so excited to get to Sydney, but I’m really sad and not ready to leave my family behind. My packing for Sydney has consisted of the suitcase I threw together while I was frantically putting my stuff into storage in Richmond last week, so needless to say, I’m also feeling anxious to see if I’ve packed the right things. So it’s definitely a mix of emotions. Mostly, I can’t wait to spend the next six months really getting to know Australia! 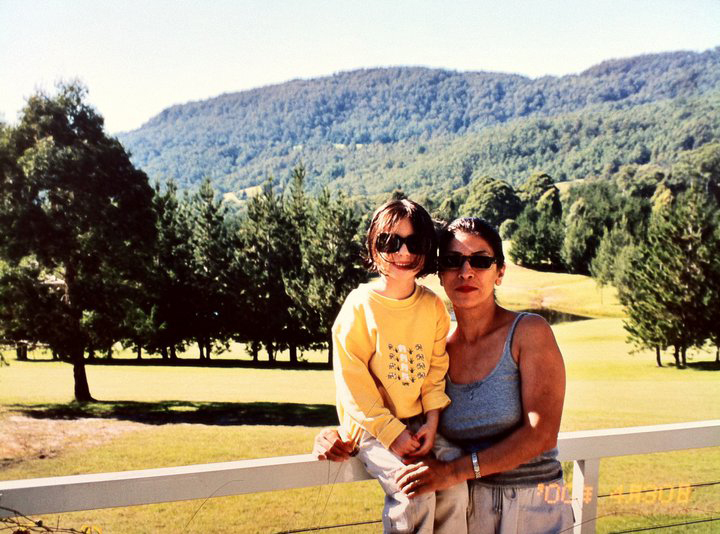 #TBT My mom and I in the Australian countryside. I’m excited to revisit some of my childhood memories! Finally, this is the last post. I’ve boarded my plane, reached my destination of home, and am back in the United States. My study abroad is over. But really, it doesn’t feel like it is. I think one of the hardest parts about studying abroad really is the end; the part where you leave the country you spent a significant portion of your life in. Once you get home, it hits you that you’ve just left the country, school, and friends you had just started calling your own. You start to realize that you really were in another country (in this case, halfway around the world) and going back to visit just isn’t something our current level of human technology makes simple or cheap. Ironically enough, going home can make you feel…well, homesick. The thing about studying abroad is that no matter where you go, you throw yourself into a completely new environment. You toss away any foundation of who you are or friends you have or what you know and get to find out who you are without everything else you’re so used to identifying you. You throw away all the labels and, regardless of your experience, you realize that it’s something you’ll never forget. I finally understand how those people from “Lost” felt. Even though they were almost murdered countless times in the most incredulous ways, they would always feel a connection to that insane place they spent a portion of their lives in. Now, I’m not saying that my experience in Australia was equal to that of being on a deserted island. But even looking back at those low points (few and far between), I can still laugh, smile and feel some sense of wistfulness. With that said, I have made my own patented guide to cope with returning. (Mike), you have just returned from your study abroad experience. At times, you may feel it will be hard to cope. Therefore, someone has composed this multi-step guide for your benefit. 1. Although modern technology has yet to provide us with teleportation devices, molecular destabilizers, etc., it has provided us with Facebook and Skype. It makes keeping in touch much simpler. And though you may want to cut off your entire trip’s existence altogether to make it easier on yourself, your trip happened, so deal with it and cherish it. Miss your friends and keep in touch — it’s normal. And didn’t you make friends who are back in America now, too? Keep in touch with them as well; you can reminisce together. 2. Refer to step 1. With this guide, my study abroad trip really does come to an end. However, the experience really never does quite end. Mate 1: Sorry mate, I don’t do the whole arvo tea thing. Mate 1: Oi! Get over here mate, the footie game’s about to start! Cheers– much like the cheers said at a toast, but can also be used as a response to an act of kindness you have received. Mate 1: Hey mate, who do ya barrack for? Mate 2: I barrack for the Essendon Bombers of course! Mate 1: If he had made that last mark, he would have been close enough to score and win the game! Mate 1: Did you see that speckie?! He got on that other bloke’s shoulders to mark that! Mate 1: I finally did it! I spoke to that Shelia I’d been telling you about! Mate 2: Ey! Get on ye mate!